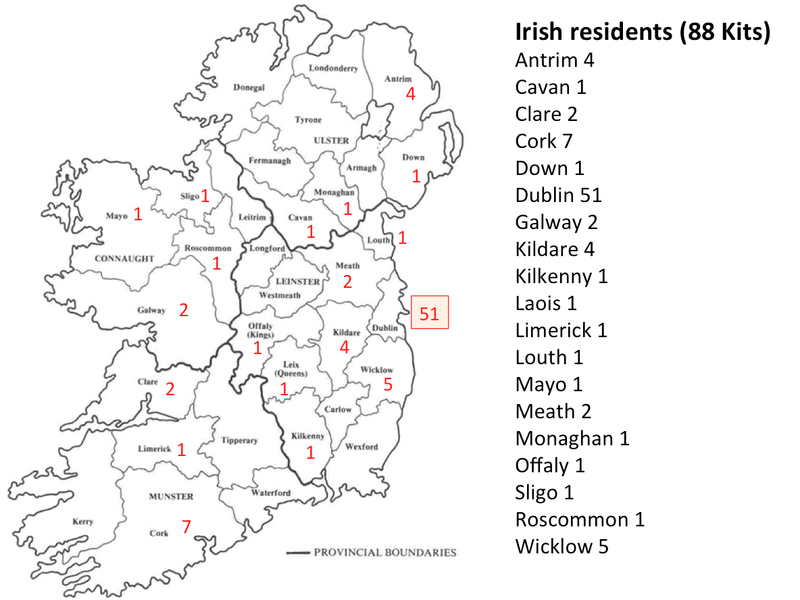 Genetic Genealogy Ireland: What do UK & Irish customers look like? What do UK & Irish customers look like? FamilyTreeDNA (FTDNA) is the only one of the major DNA testing companies to sponsor major genealogy events and exhibitions. Such events usually involve a set of sponsored DNA Lectures as well as an FTDNA stand offering DNA tests at discounted rates to the general public. Two recent events sponsored by FTDNA (and organised by ISOGG*) were Who Do You Think You Are in London (20-22 Feb 2014) and Genetic Genealogy Ireland at Back to Our Past in Dublin (18-20 Oct 2013). Below is a comparison of some of the statistics from the two events. Customers underwent a triage system before they took the test - an ISOGG* volunteer would explain the three main types of DNA test and help the customer decide which one might be best to address their specific situation and any particular Brick Walls they were facing in their research. Altogether, customers bought 485 kits at WDYTYA2014 and ordered 550 tests. At GGI2013, 99 kits were bought and 113 tests ordered. At both events, the autosomal DNA test (atDNA, Family Finder) proved to be the most popular, followed by Y-DNA in second place and mitochondrial DNA (mtDNA) in third. There were important differences between the two events which warrant cautious interpretation of the data. 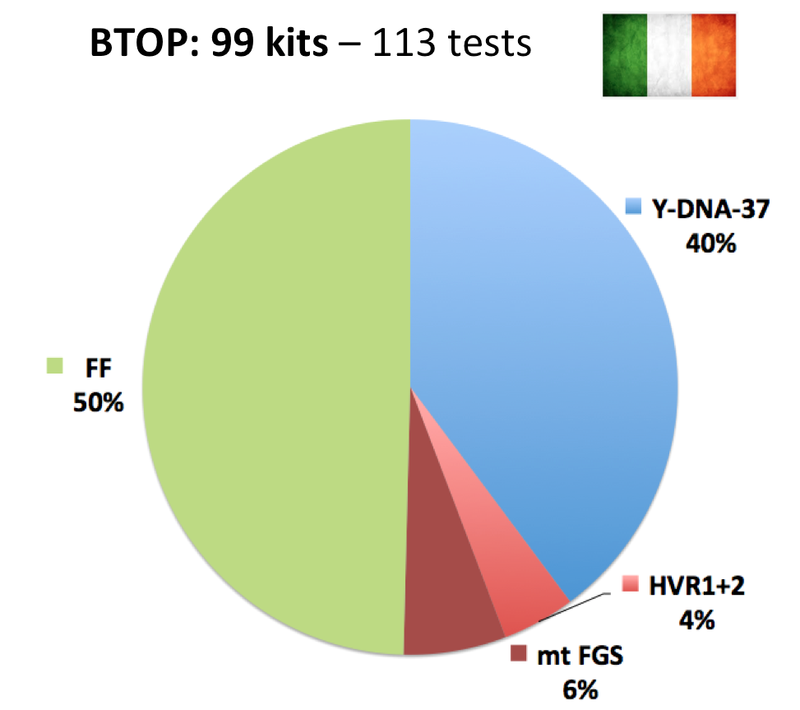 This was the 6th year of FTDNA's presence at WDYTYA but only their first at BTOP so the Irish audience were possibly less aware of FTDNA and genetic testing than the UK audience. In addition, the Y-DNA-12 and mtDNAplus (HVR1+2) tests ($49 each at the show) were not widely advertised at the Dublin event but were at the London one. 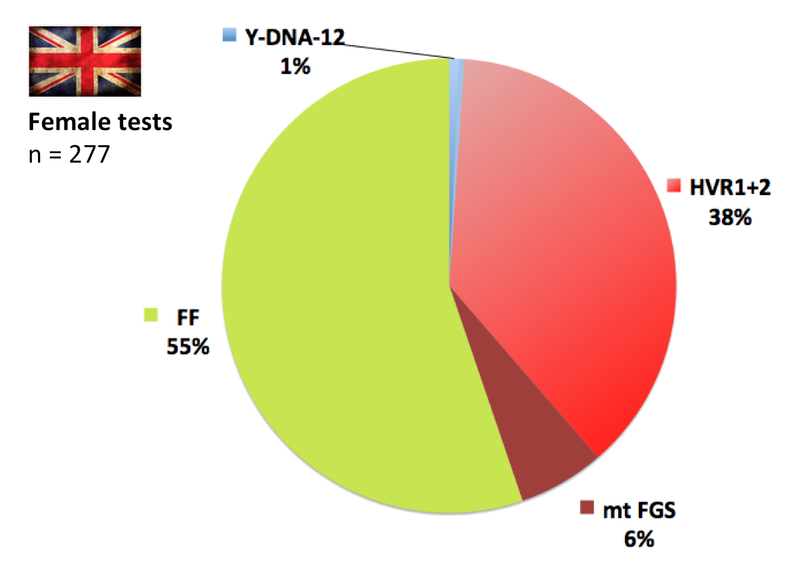 Further breakdown of the WDYTYA data reveals that the most popular mtDNA test was the basic mtDNAplus test (HVR1+2, 23% out of 29%), with only 6% ordering the mitochondrial full genome sequence (mt FGS). 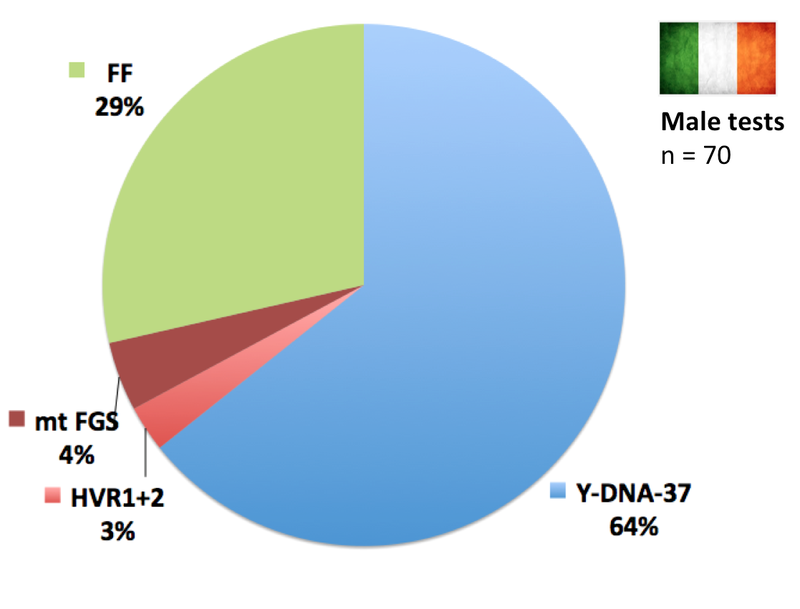 Y-DNA tests were more evenly split between Y-DNA-12 (13%) and Y-DNA-37 (17%). A total of 36% of customers bought the most basic tests (Y-DNA-12 and mtDNAplus), suggesting that about one third of all customers are simply dipping their toe in the genetic water (and are reluctant to take an immediate plunge into the gene pool). Further analysis confirms that 36% of females and 37% of males ordered a single basic test and none other (or only ordered the two basic tests and none other: 4 males). Family Finder was the most popular of the DNA tests ordered by women at both events, particularly in Dublin, accounting for 84% of all female tests. The number of takers for the basic mtDNAplus test (HVR1+2) might have been bigger in Dublin had it been advertised as widely as it was at the London event. However, the data suggest that for women the Family Finder test was seen as a more useful and relevant test for standard family tree research in both the UK and Ireland. For men, Y-DNA was the most popular test accounting for almost two-thirds of all tests ordered by men. 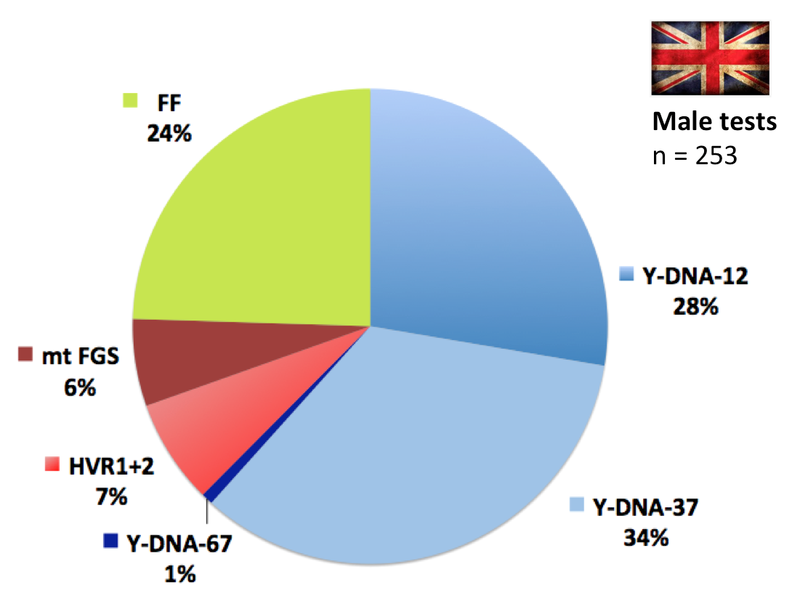 At WDYTYA, the Y-DNA-37 marker test was the most popular (34%) followed by the Y-DNA-12 (28%). At both events, Family Finder proved more popular than mtDNA among men, accounting for about a quarter of tests ordered. Multiple tests were ordered by 11% of women and 22% of men, almost double the amount. This probably reflects the greater choice that men have in terms of the type of tests on offer. More women than men bought kits in the UK (55% compared to 45%), possibly reflecting the female preponderance among genealogists. The reverse was true in Ireland with 61% of kits being bought by men, possibly suggesting that in Ireland at least, behind every good man there is a woman with a knife in his back ("You will buy that DNA test, dear"). And lastly, although the Dublin event was a National event, most of the people who ordered kits were from Dublin and surrounding counties. This points to a possible need for "DNA outreach work" to areas that are more remote from the event location in order to ensure a more even coverage of the country. The same is probably true for the London event, and there is probably a need for greater regional coverage. The advent of WDYTYA Scotland in August of this year would be an excellent venue for DNA testing, but other regional events should also be identified, both in the UK and in Ireland. These results raise several important points for discussion. The popularity of the basic tests suggests that a lot of people are simply curious, may not understand all the nuances of DNA, and simply want to dip their toe in the water. The fact that this group of customers accounts for about one third of the total group emphasises the fact that there will always be an ongoing and continuous need for basic education of "newbies" regarding genetic genealogy and how to interpret and use their results. Following the WDYTYA event, we designed a "new and improved" welcome email for new FTDNA customers which contains instructions and suggestions on what to do while waiting for your results and has links to a variety of different resources. The popularity of the Y-DNA-12 test may be surprising and somewhat frustrating to some genetic genealogists who may contend that you can't learn anything from a 12-marker test. However, from the experience of my Irish Caribbean project, it is certainly very helpful for determining whether the direct male line goes back to an African man or a European man. This would also be useful information for African American customers. 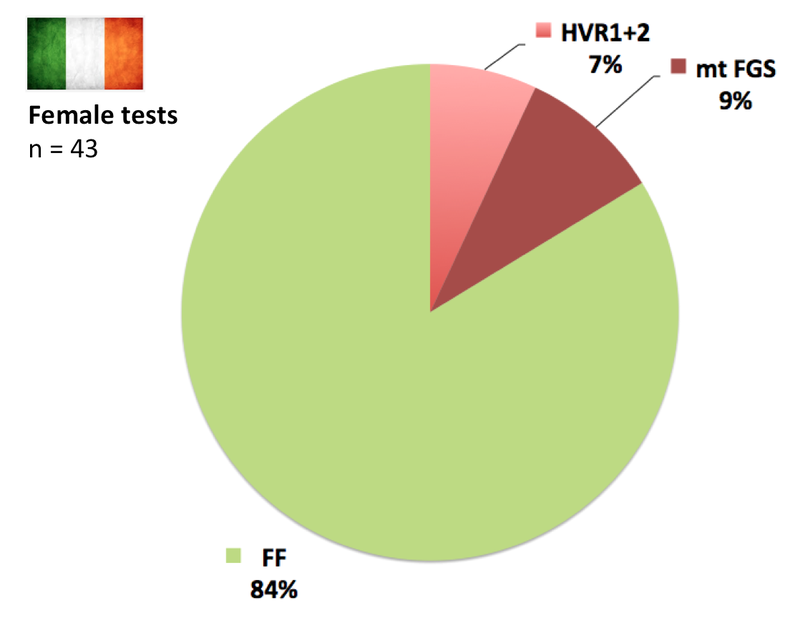 In addition, in rare cases 12 markers may be sufficient to match individuals, especially where rare marker values are present, or a combination of unusual markers. Group B in the Wheaton DNA project is a good example of this. The first 5 markers can be used as the basis for a match. Furthermore, customers know that the Y-DNA-12 is an "introductory" test and they can always upgrade later. And convincing someone to upgrade a test is probably easier to do than trying to sell them a 37-marker test from the very start. The preponderance of autosomal DNA testing (40-50% of tests taken) suggests that people at these events are more interested in breaking down the Brick Walls in their family trees than discovering their deep ancestry. These results are in keeping with the poll conducted on this website (and previously reported here) with currently 69% of respondents choosing atDNA as the most relevant test for them. This raises the questions: is there sufficient support for these people when it comes to helping them interpret their results? What kind of support with atDNA do these people need? Y-DNA projects are common and have a Project Admin to help guide project members, but atDNA projects are rare and there is thus a relative lack of supportive Admins. In short, with Y-DNA you get support, with atDNA you largely go it alone. Some Y-DNA projects are beginning to allow Family Finder testers to join the project, but do Project Admins (more used to dealing with Y-DNA) feel comfortable advising their members about the use and interpretation of atDNA? Is there a need to up-skill Project Admins in the use of atDNA? Given the popularity of the atDNA test, it is perhaps no surprise that the most watched video of the DNA Lectures at both WDYTYA and BTOP specifically addresses the interpretation of atDNA results. Despite these outstanding questions, there is little doubt that DNA testing is growing in popularity and the education and support of new customers will be a continuing need for some time to come. I am glad that someone is finally addressing the need for Family Finder inclusion in surname projects and a greater level of support for Family Finder customers in interpreting and utilizing their results. I know in one particular instance that the group administrator is not at all interested in anything except Y-DNA results (and is even very slow in updating results for that!) It might be best to find separate administrators for Y results and Family Finder results, if the original administrtor is not interested (and thus not even knowledgable about Family Finder results. I have an autosomal kit sitting in my house now, but the big question should I get my brother to take the test or my son?, how many generations will it take me back, if I use it on my son I know it will include my husbands family also, what would you do? It depends what you want to find out. If you are interested in connecting with cousins on your side of the family, then you or your brother could test. If you want to connect with cousins on your husband's side then you could test him. And if you want both, you could test your son. However, the test has a "reach" of about 5-7 generations which is approximately 200-250 years, so you would be able to "reach" further back by testing you are your husband rather than your son. Either yourself or your brother (the autosomal is used by both sexes - the Y-DNA only for the male line in which case your brother) if you want to go back one generation further than your son. Otherwise yes, your husband's family will feature if you get your son to do it.